When you hire Marla A. Joseph, you hire an attorney committed to representing her clients with compassion and zeal. Throughout her career, Ms. Joseph has concentrated her efforts on representing injured individuals in Pennsylvania Workers' Compensation, Social Security Disability and personal injury claims. As a result, she has become a leader in the Bar, with a reputation for being knowledgeable and on the cutting edge of the law. 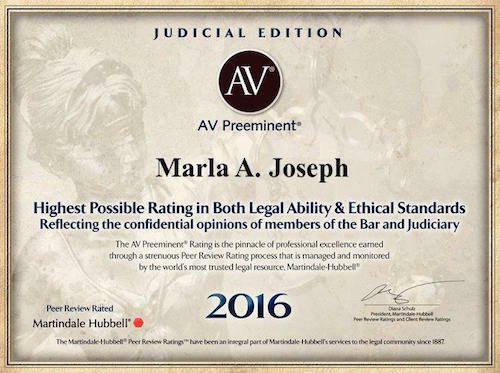 At the Law Offices of Marla A. Joseph, LLC, our goal is to meet your needs, exceed your expectations and obtain the best possible results. That is why if you are disabled because of a work-related injury, are seeking Social Security Disability benefits, were injured in an accident, or have a permanent disability, you need Attorney Marla A. Joseph to fight for you. 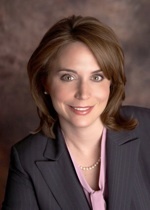 Pennsylvania workers' compensation lawyer Marla A. Joseph never represents insurance companies. Rather, she focuses her practice on assuring that her clients' rights are protected and that they receive all of the compensation they are entitled to. Marla Joseph provides personal representation for her clients at every stage of every proceeding, and regularly appears before Workers' Compensation, Social Security, Common Pleas Court and appeals court judges. Whether you are eligible for or are receiving workers' compensation benefits, seeking Social Security Disability or SSI benefits, or were injured because another party was negligent, you should contact Attorney Marla A. Joseph. Don't leave yourself at the mercy of an insurance company. Call Attorney Marla A. Joseph at (215) 884-6664 or click here to send an email, and talk to someone on your side. There is no obligation, and you pay no fees unless we make a recovery for you. At the Law Offices of Marla A. Joseph, LLC, our Pennsylvania workers' compensation attorney will fight for your rights. 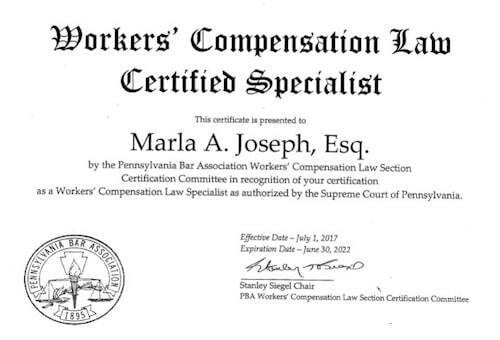 Ms. Joseph has been certified as a specialist in the practice of workers' compensation by the Pennsylvania Bar Association's Workers' Compensation Section, as authorized by the Pennsylvania Supreme Court. Pennsylvania Super Lawyers named Ms. Joseph One of the TOP 50 Female Lawyers in 2009, and has repeatedly rated her in the top 5% of all lawyers in Pennsylvania since the inception of this award.